Former industrial activities at an active manufacturing plant resulted in chlorinated solvents groundwater contamination with an extended plume of PCE and TCE, with very little presence of daughter compounds, due to the aerobic conditions of the aquifer. 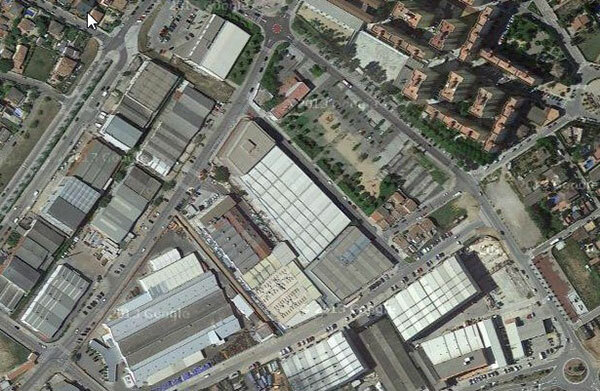 As the source area was not accessible due to ongoing industrial activities on the site, voluntary remediation activities took place in the plume, located in areas external to the buildings. 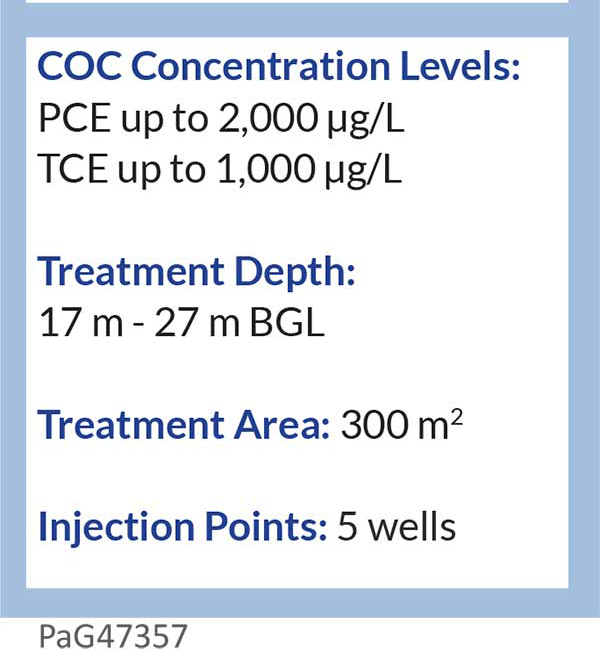 A pilot trial was performed on the site in 2012, during which a combination of 3-D Microemulsion (3DMe® ) and Hydrogen Release Compound Primer (HRC Primer® ) electron donors were injected into an existing monitoring well. 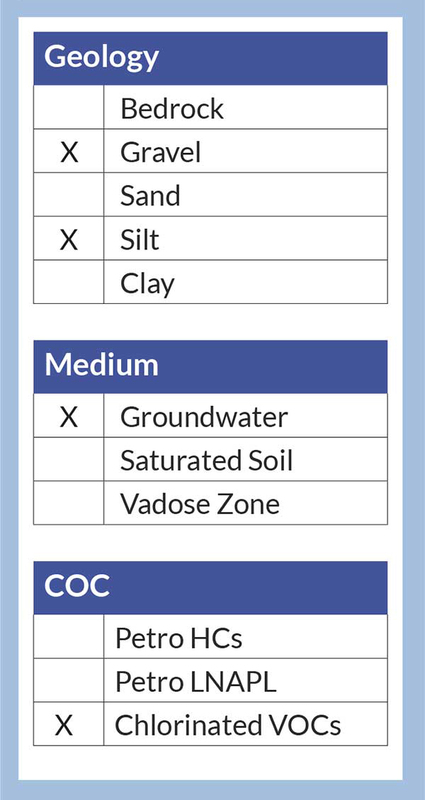 Results were measured from down-gradient monitoring wells and showed successful treatment of the contaminants of concern, after which full scale remediation activity was carried out via other existing wells using the same mixture of 3DMe and HRC Primer as in the pilot trial. The application was performed by injecting 3DMe and HRC Primer together under pressure into 5 wells using a packer system. Application activities took place at the end of 2013 and monitoring is ongoing. Both 3DMe and HRC Primer are electron donors in liquid form, which can be injected easily through wells. The application of 3DMe provides the aquifer with a staged release of hydrogen in aqueous form (directly available for the support of anaerobic microorganisms) for a period of 3 to 5 years from the time of injection. The use of HRC Primer, which provides a fast release of hydrogen over a few months, delivers an initial burst of electron donor in order to overcome additional request coming from competing electron acceptors such as nitrates and sulphates and quickly creates strongly anaerobic groundwater conditions. 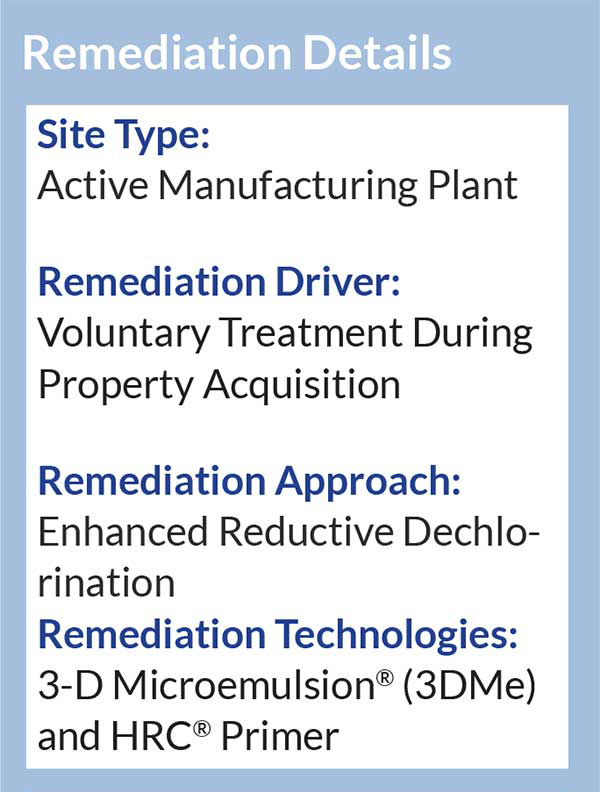 The unique distribution mechanism of 3DMe, based on micelle formation, allowed treatment to be performed using a small number of injection points, and therefore removed the need to install new injection points to keep project costs and site disturbance to a minimum.